West side Iron nos puso todas las rejas en las ventanas y las puertas de nuestra casa y quedaron preciosas. Las hicieron como las habíamos solicitado y con materiales de primera calidad. La instalación fue muy rápida y estamos muy satisfechos con el trabajo. I had window security bars custom made at Westside Iron. I was very pleased with the work and quality of the bars. The people here are very nice, I would definitely recommend their services. I look forward to working with them in the future, I will be ordering a Security Door for my residence as well. Keep up the good work and thank you very much for your services. From beginning to end, the service received by Maria & husband was amazing and I couldn't be happier with the finished product!. Excellent quality, smooth installation & professional customer service. I will recommend your company and for sure I will used again! Thank you "Westside" for adding the perfect finishing touches to my house???? Westside Iron installed hand railings at our home. They did a very professional job. I can recommend them highly. From the time I called and asked for an estimate till the completion of the job, everything went just perfect. Maria gave me an excellent estimate, I agreed on the price and a date was set for installation. Curtis and another employee were right on time, performed the installation and cleaned up the area. I now have beautiful railings for my front steps. Couldn't have asked for anything more. Westside Iron installed a white powder coated aluminum railing for my second story balcony. I have many positives to share about my experience including a prompt estimate from Maria and a price that was more reasonable than others. The install was very difficult because I had fragile tile on the balcony, but they did not even crack a single piece. Even my hurricane shutter installer commented that they did a good installation. All in all it was an easy process and I am grateful. 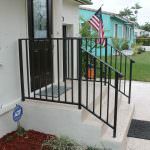 We used Westside Iron recently for some powder coated aluminum handrail on a house in Miami Springs, that needed to match adjacent decorative wrought iron railing. Maria was prompt to respond, and had good suggestions when she came out for a site visit. The project was completed with a quick turnaround and the fabrication and installation guys did quality work. You get good bang for your buck with Westside Iron. Fast Service, Quality work, great customer service!! I purchased a new home and was in search of someone who can install a railing on my front porch. I called a few places and either didn't receive a call back. I came across WestSide Iron and received a prompt response. They worked with me to get the railing up before my inspection, and pricing was very reasonable. The railing came out amazing and I am very happy with the quality. We have some additional work that needs to be done, and I am definitely going to use them again. Good price , good product and great service. I had an excellent experience with Westside Iron. They installed window bars and fence. Maria and Curtis were very responsive. They kept every appointment they made, came out to measure within 24 hours, provided important feedback and suggestions and they installed the final products one week earlier than they projected. They listened to all of my concerns and offered great solutions. The work was done with very high quality and great follow through. I am delighted to highly recommend this company. Please feel free to contact me at garcia26@aol.com if you want further information or feedback. We had an ornamental handrail installed on the stairs leading to the front door. We also had a plain rail installed along the outside wall of our kitchen for use when climbing to the stoop outside the kitchen door. Work was performed on schedule and in accordance with the estimated price. We are happy. Westside Iron, LLC, installed an aluminum fence at the front side of my house located in a corner and they performed an excellent job. Their crew, headed by Mr. Larson, is very professional and well qualified one. I strongly recommend Westside Iron for any work related to Aluminum, Iron or any other metal work. Just wanted to let everyone know what a pleasure it was dealing with this company. My family and I are very pleased with how the stair railings came out. We got several estimates from other companies and found this one to not only be cheaper but best customer service and quality. 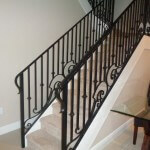 We always get a lot of positive compliments on the stair railings. I would highly recommend this company to any prospective customer. I contacted WestSideIron and the awesome Maria Dolores helped me on the line that day. In less than a day she went to my house to measure the railings, gave me a quote in less than 24 hours and I had my railings installed within a week. They look awesome and I am very pleased with the service, the quality and the instalation timing. Highly recommended! Hard to find this level of customer service and attention to detail. Maria and Curtis were extremely professional and accommodating in designing, fitting and delivering a custom, hand designed interior stair rail for my condo. From a photograph, they determined how best to style the rail in my space keeping in mind necessary safety requirements. The finished product far exceeded my expectations - the railing is a work of art! 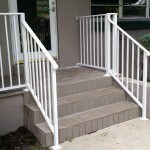 We recently hired West Side Iron to manufacture and install two gates in our backyard and make a repair to an existing railing. Maria came to our house with a technician and listened to my request. They took notes and asked questions that brought things to my attention that I would not have thought about. I was in a rush to get the gates installed because we had guests coming with a dog. They completed the gates in the time promised and repaired the railing perfectly! i would definitely work with them again and I highly recommend this company! I called this company for an estimate and was so pleased with their professionalism, competitive pricing and amazing work. Maria Dolores was always responsive to my emails. I highly recommend them and will be referring them. They didn't miss a beat! Thank you, West Side Iron. Working with Westside Iron has been an absolute pleasure. 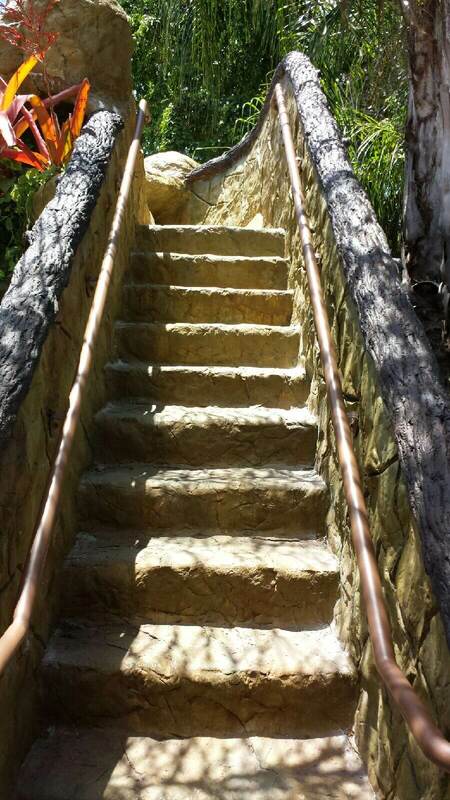 We are on a project that needed some detailed handrails. Called and spoke to Maria. So informative and helpful. Quickly got back to me with the information I needed and a quote. Order our materials and within a week everything was installed. The communication from them was outstanding!! Maria Dolores and Curtis assisted us in every step of the way. They guided us selecting the styles, colors and designs that best suited our property. They delivered a professional service, prompt attention, and an outstanding product! We're extremely pleased with WestSide Iron! We hired Westside on two (2) separate occasions. Once for the design & installation of our front entrance gate and for our front entrance door. Our beautiful railings exceeded our expectations. Maria and Curtis were courteous and professional. Thank you Maria and Curtis. Your work is as good as it gets! West Side Iron furnished us with a nice looking fence and window bars for our home. Maria & Curtis were quite professional and courteous attending all of our requests throughout the entire process. Their working crew was knowledgeable and skilled. I would highly recommend West Side Iron for any fencing, railing or other iron or aluminum works. We were very pleased with the results. Thank you Maria & Curtis!